People all over the world enjoy tempura  the Japanese delicacy of battered vegetables and seafood. But few fully appreciate the value of what remains in the pan after the fried foods have been prepared. In Japan, households throw out nearly 200,000 tons of used cooking oil every year, some of it simply poured down the drain, from where it pollutes local waterways. For Yumi Someya of U's Corporation, all that grease and grime is a hidden treasure. 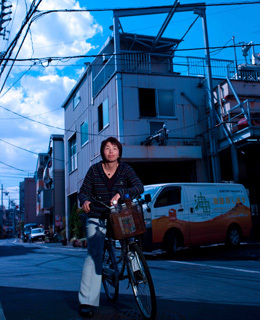 "Tokyo is a big oil field," she says, "and every home and restaurant is a spot for drilling." Recycling cooking oil sounds like the sort of green business you expect to spring up in the 21st century. But Someya, 40, is the third generation at a family-owned recycling company founded in the ravaged and famished postwar Japan of 1949, when any kind of oil was a precious commodity, and used cooking oil, once cleaned, found a ready market. Someya didn't realize just how relevant the family business was until she survived a terrifying landslide while vacationing in Nepal at age 18. On being told that urbanization had contributed to her ordeal  the area had been deforested for road construction  she began to think about environmental issues. "I saw that we had become affluent," she says, "but there was much that was lost." Someya urged her father to reposition the family company as "an environmental business of the future." The firm began expanding and experimented with turning cooking oil into fertilizer and soap. But the real breakthrough came in 1992, when Someya learned that biofuel had been successfully derived from soybean oil, and decided that used cooking oil could have a similar application. In just nine months, a team of researchers from the family firm and from Hokkaido University produced the world's first biodiesel derived from the oil cooks throw away every day. Named Vegetable Diesel Fuel (VDF), it emits no sulfur oxides and just half the particulate matter of conventional diesel. At $4 per gal., it's also affordable. Its most distinctive feature is its scent: vehicles powered by the fuel smell like mobile kitchens. VDF currently fuels Someya's fleet of oil-collecting trucks, as well as some city buses and service vehicles that maintain Tokyo's expressways. It's also used to generate electricity at events like the Fuji Rock Festival and Earth Day Tokyo, and the family company has made a compact VDF-production machine for sale to anyone who wants to do a bit of backyard recycling. Now independent from the original family concern, U's Corporation collects about 100 tons of oil a month from 5,400 restaurants and 100 collecting stations. Someya has a grand plan  she calls it "Tokyo Yuden 2017," yuden meaning "oil field" in Japanese  to be recycling all the used cooking oil in Tokyo within eight years. "It's tough but worthwhile and I enjoy it," she says. "We are solving environmental problems and running a business." Not to mention making the streets smell a little more appetizing.